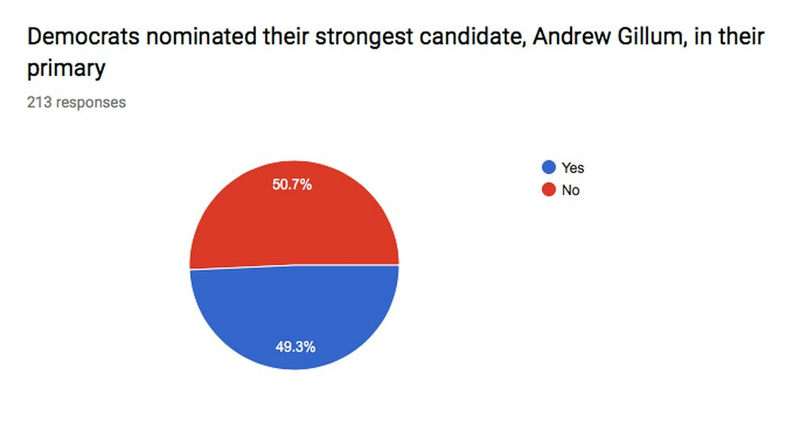 Among more than 200 experienced Florida political players surveyed Sunday for a Florida Insider Poll Andrew Gillum is heavily favored to win the governor's race and Bill Nelson more narrowly favored to win re-election. 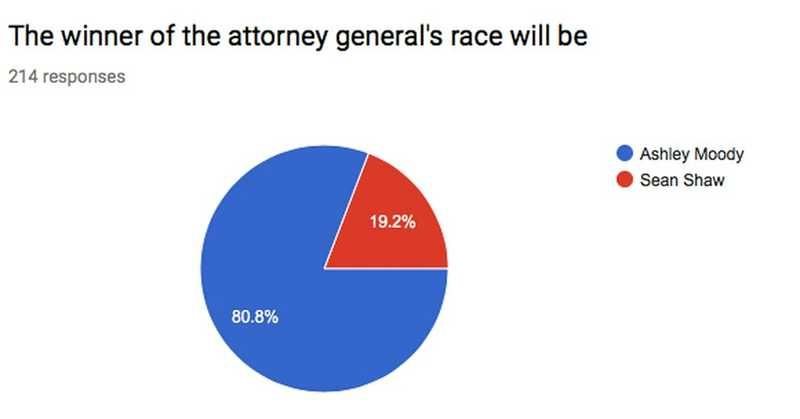 Two thirds of those surveyed expect Gillum to beat Republican Ron DeSantis, and 54 percent expect Nelson to beat Republican Rick Scott. 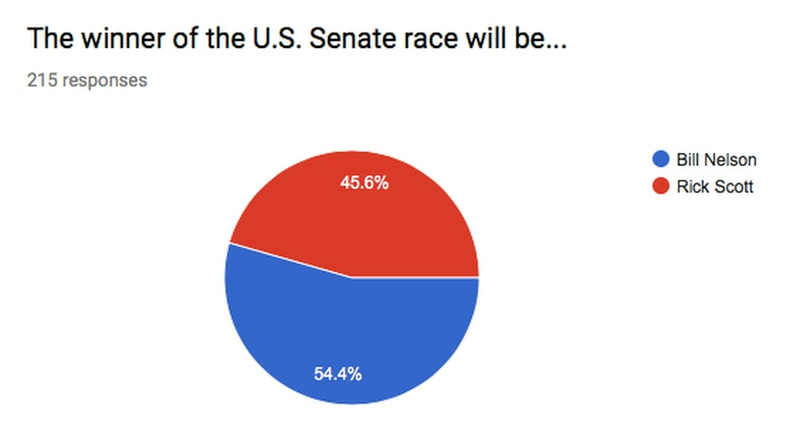 Shortly after the primary, most Florida Insiders expected Scott and DeSantis to win their races. These Insider Polls reflect the conventional wisdom of Florida's political establishment – campaign consultants, lobbyists, fundraisers, activists, political scientists – rather than reality. In fact, with respect to our Insiders, they are often wrong. Presidents Hillary Clinton and Jeb Bush and Democratic gubernatorial nominee Gwen Graham can attest to to that, as those were the Insiders' predictions in '16 and '18. 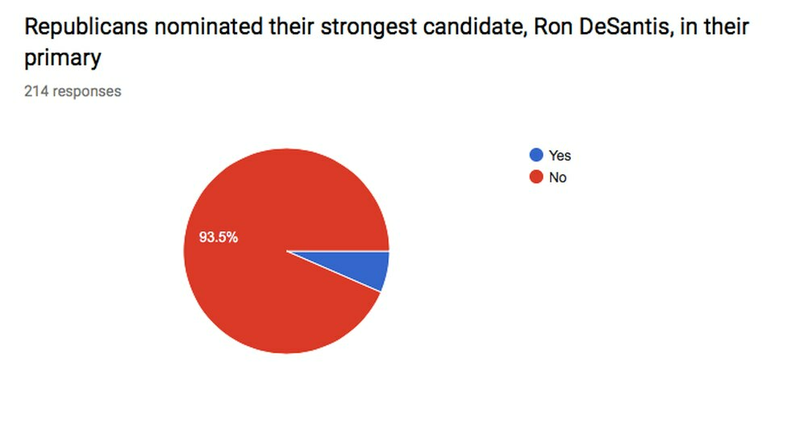 Asked if Republicans and Democrats nominated their strongest primary choice, Democrats were evenly split and Republicans almost unanimous that DeSantis was not the strongest nominee. He trounced Agriculture Commissioner Adam Putnam in the GOP primary thanks in large part to support from President Trump. "DeSantis ran the worst campaign I've seen. Poor messaging, little inspiration, offered no compelling reason to vote for him," a Republican said. "He failed to tell a story. He will win by the tightest of margins – a sliver – despite his poorly run campaign." "If Gillum wins I blame Trump," another Republican said. "Only reason why this Governor's Race is so close is because Trump endorsed DeSantis in the primary. Putnam would have had lead and not need Trump to travel to FL to rally (rescue) the base when we should be winning NPAs at this stage. "I have no doubt we would not see a Blue wave in a Florida had Adam been their nominee," said a Democrat. We allow our Insiders to weigh in anonymously to encourage honest answers. 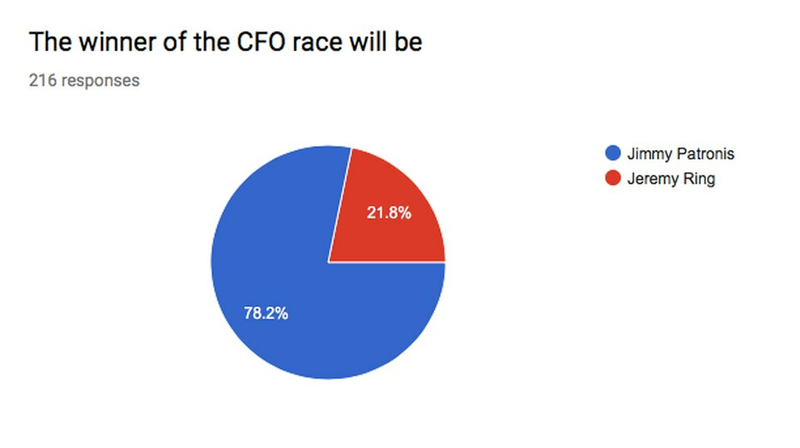 Many of those surveyed are working for the campaigns in question. More than 47 percent of the Insiders in this survey are registered Republicans and nearly 44 percent Democratic. 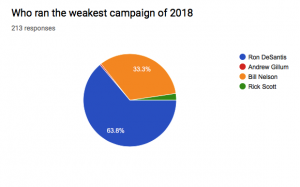 Nearly two thirds of the Insiders pegged DeSantis as running the worst campaign in the gubernatorial and senate races. Nearly one third said Nelson. "DeSantis allowed Gillum to introduce himself before he was attacked. To win, you have to stand for something and show backbone. Gillum did that and DeSantis did not," said a Democrat. 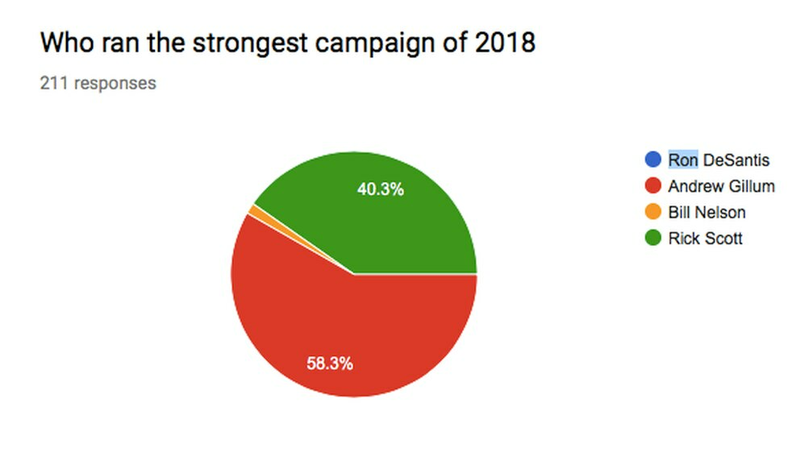 And the best campaign? Fifty-eight percent said Gillum ran the best, and 42 percent said Scott. 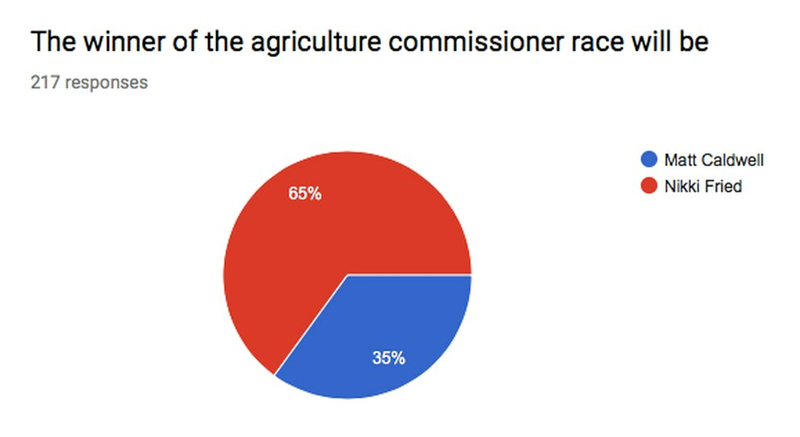 The Insiders overwhelmingly expect Republicans to win the races for chief financial officer, and attorney general — but nearly two thirds think Democrat Nikki Fried will be the next commissioner of agriculture and consumer services. Darrick D. McGhee, Fred Karlinsky, Ryan Wiggins, Ryan Duffy, Barry Edwards, Gretchen Picotte, Screven Watson, Slater Bayliss, Bob Poe, Jeff Wright, Ron Pierce, Jim Rimes, Jeff Wright, Aubrey Jewett, Zachariah Zachariah, John Konkus, Kristy Campbell, George Riley, Steven Vancore, Chip Case, Jason Unger, Erin Aebel, Gus Corbella, Brian Ballard, Jeff Hartley, Rick Boylan, Bernie Campbell, Richard DeNapoi, Joe Saunders, Chris Kise, Bob Buckhorn, Juan Penalosa, Scott Peelen, Anthony Pedicini, Katie Bohnett, Franco Ripple, Eriin Isaac, Al Maloof, Jorge Pedraza, Kevin Cate, Slex Sink, Mike Fasano, Fred Piccolo, Kirk Pepper, Cory Tilley, Ashley Walker, Doug Kaplan, Mike Hanna, Patrick Slevin, Steve Schale, David Bishop,Dean Cannon, Evelyn Perez-Verdia, Tom Alte, Geoffrey Becker, Steve Uhlfelder, Marion Hammer, Husein Cumber, Nancy Watkins, Clarence McKee, Greg Turbeville, Kathy Mears, Chris Hand, Jeff Johnson, Lourdes Diaz, Jon Costello, Karen Unger, Henry Kelley, Eric Zichella, Alan Clendenin, Ellen Freidin, Stafford Jones, Cynthia Henderson, Kim McDougal, Nancy McGowan, Hayden Dempsey, Christian Ziegler, Zach Learner, Alan Levine, Gregory Wilson, Julia Gil Woodward, Joshua Karp, Tom Lewis, Towson Fraser, Jason Altmire, Christian Camara, Alia Faraj-Johnson, Dominic Calabro, Sean Phillippi, Wayne Garcia,Karl Koch, Nancy Texeira, Damien Filer, Greg Blair, Ken Jones, Jackie Lee, Rick Asnasi, Susie Wiles, Stephanie Kunkel, Ann Herberger, Scott Simpson, Stephanie McClung, Thomas Grigsby, Josh Geise, Rachel Perrin Rogers, Kevin Watson, David Custin, Mark Foley, Tim Baker, Terry Fleming, Eric Jotkoff, Greg C. Truax, Phillip Thompson, Wayne Bertsch, Mike Hamby, Tom Scherberger, Andy Ford, Jennifer Green, Hunter Conrad, Tom Scarritt, Bill Lee, Eric Eikenberg, Nan Rich, Mike Abrams, Susan Glickman, Frank Tsamatoules, Robert Wexler, Ana Navarro, William March, Max Herrle, Bud Shorstein, Roly Marante, Reggie Cordozo, Ashley Bauman, Jeff Kottkamp, Alan Becker, Jill Chamberlin, Scott Barnhart, Jason Roth, Pat Neal, Paula Dockery, Stan Adkins, Doc Dockery, Stan Adkins, Richard Gentry, Alan Stonecipher, Jim Cherry, Kelly Cohen, Matthew Isbell, Peter Wallace, John Morgan, Mark Zubaly, Jim Horne, Pete Dunbar, John French, Brian Burgess, Dave Aronberg, Sam Bell, Karen Thurman, Rich Heffley, Rick Wilson, Ron Sachs, Ron Bilbao, Richard Swann, Donna Arduin, Jack Furnari, Beth Matuga, Ana Cruz, Andrew Weinstein, Dan Smith, Jamie Wilson, Mitch Ceasar, Sarah Rumpf, Victor DiMaio, Jose Mallea, Allan Bense, Christina Johnson, Mike Hightower, David Johnson, Mark Ferrulo, Brad Coker, Nikki Lowrey, Eric Kirk, Greg Ungru, Jon Woodard, David Colburn, Matthew Corrigan, Seth McKee, Matt Bryan, Eric Johnson, Abel Harding, Tom Tillison, Alex Burgos, Chip LaMarca, Jack Hebert, Travis Blanton, Brian Franklin, Christina Baker, Eduardo Gammarra, Kathleen Shanahan, Samuel Neimeiser, Lucy Morgan, Jon M. Ausman, Monica Rodriguez, Bob Graham, Kirk Fordham, David Mica, Jim Davis, Betty Castor, Terrie Rizzo, April Schiff, Darryl Paulson, Robert Watkins.